VietNamNet Bridge – Proper emergency medical assistance could help save people's lives at a lower cost and with simpler treatment than waiting for care to begin upon arrival at the hospital, said President of the Viet Nam Association of Critical Care, Emergency Medicine and Medical Toxicology Prof Vu Van Dinh. He made the statement while speaking to delegates at a two-day international symposium on pre-hospital emergency medicine held yesterday, Nov 11, in Ha Noi. He said the country should develop a force of emergency technicians or paramedics to better help patients before they reach the hospital. Health Minister Nguyen Quoc Trieu said that few healthcare providers nationwide were able to respond to emergency calls within 15 to 30 minutes, the so-call ‘diamond and gold period' for saving people with health emergencies. The country currently has 115 emergency centres responsible for pre-hospital emergencies in a number of localities. Other authorities, such as fire-fighters, police, air guards and residents have yet to actively participate in helping victims before they reach the hospital because they do not have the proper skills. 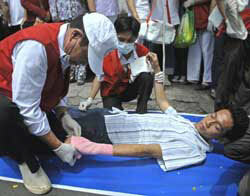 Director of Thanh Nhan General Hospital Dang Van Chinh said people died on the way to the hospital almost every week because of poor first aid and emergency assistance at the scene. Traffic accidents result in 11,000-12,000 deaths annually in Viet Nam, and about 50,000 people are injured and need medical assistance at the scene, reported the National Road Safety Committee. One serious problem is that communication between emergency centres and hospitals, ambulance staff and hospitals, and within individual hospitals has yet to develop. "This leads to overcrowding in big hospitals and results in patients being unable to access timely emergency treatment," Chinh said. Since 2008, Thanh Nhan Hospital and the Association of Critical Care, Emergency Medicine, and Medical Toxicology has been studying the pre-hospital emergency models used by two American hospitals, St Anthony Hospital in Colorado and the Mayo Clinic in Minnesota, said Ha Noi Health Department director Le Anh Tuan. The core of the system is to have professional health technicians or paramedics who can provide emergency assistance, especially in the case of fires, disasters and terrorism, said Tuan, adding that the model is suitable for application throughout the entire country. Vice head of the hospital's Recovery Department Nguyen Thanh, who learned about the American models directly from the source, said that paramedics was a very new concept in Viet Nam and there was still not a comprehensive paramedic training programme in the country. Even health officers lack proper awareness about the role paramedics can play, he said, adding it would take about six months of vocational training to teach nurses to be paramedics. The establishment of a pre-hospital emergency training centre would help solve the problem. They could re-train nurses and doctors to perform a first responder role, and even provide first-aid training to the general public. Chinh, the hospital director, also recommended setting up emergency co-ordination centres to help ensure communication and co-operation between emergency responders and hospitals. "The centres would help balance the number of patients at hospitals, avoid overcrowding and make treatment faster," said Chinh.